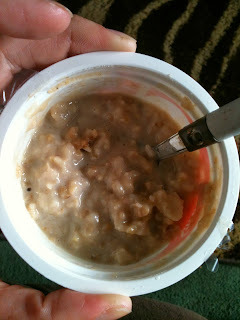 ♥ Mama 2 Multiples ♥: Smart Ones Oatmeal Review & Giveaway! I love trying new things, and a favorite thing of mine to try are new foods, whether it be desserts, breakfasts, or new dinner ideas. That's why I was so excited to try out new Smart Ones oatmeal when I was approached by the company and asked to work together for this blog post! I received two coupons for free Smart Ones oatmeal products to use at my local grocery store. I chose the Maple and Brown Sugar oatmeal and the Apple and Cinnamon oatmeal for my review. These are two of my favorite flavors! I tried the Apple and Cinnamon flavor first, because it was my top favorite of the two. I couldn't wait to give these oatmeals a try! The first thing I noticed was how easy these are to make and how quick...only a couple of minutes and no mixing in a bowl or anything, since they come mixed in their little disposable containers. The portions are just enough too, and because they are fairly small, it's easy to thrown one in your purse, backpack, or other bag for school, work, or anything else you need to be on the go for! I have to be honest though. I was not too impressed with the taste. They really didn't have much for flavor, which was disappointing because I was SO excited to try these out. It was just bland to me. It could just be that my taste buds are different from others, and maybe it just didn't "rub me" the right way. Everyone is different, after all. Regardless, I would give them another try, because maybe I just got a weird container? It would be due to any number of reasons, but I would still give these products another try and still recommend others to try them out too, because we all have and like different things. Purchase it: You can purchase NEW Smart Ones Oatmeal and other Smart Ones products at a grocery store near you! WIN IT: THREE lucky readers of Mama 2 Multiples are going to WIN a coupon for a FREE Smart Ones product of their choice! To enter, simply follow the instructions and fill out the Giveaway form below! Come on over and follow me on Blog Lovin'! **DISCLAIMER** I received the above product(s) from Smart Ones free of charge in exchange for an honest review. No other compensation was received. However, all opinions are strictly my own.